Relax in elegance and seclusion on beautiful Panmure Island. Luxurious Georgian Colonial B & B oceanfront home with beautiful island antiques and artwork, offering the ultimate in relaxation. Secluded pristine 25 acre waterfront estate, overlooking Cardigan Bay. Enjoy walks on private, sandy beach, one mile sandbar and breathtaking sunsets. Tastefully furnished spacious bedrooms with water or woodland views, ensuite bathrooms, whirlpools and private verandahs. Comfortable sitting rooms overlook the bay. Gourmet full breakfasts. Walk to lighthouse. Other attractions and golfing nearby. Southern Hospitality. 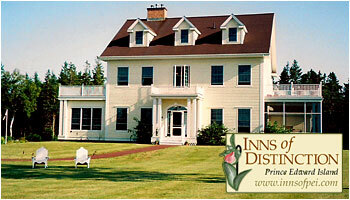 PEI Inn of Distinction. Our lovely cottage will be available during the 2019 season. Book early to avoid disappointment. 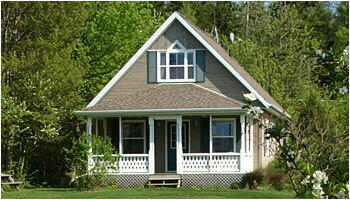 Our custom-designed, water front, two-story cottage has approximately 1,100 square feet of living space with an attached covered porch. The house is situated with a north-north west view of Cardigan Bay and Georgetown making it ideal for watching sunsets. The cottage is just minutes away from the Panmure Island Lighthouse, one of four lighthouses opened to the public on the Points East Coastal Drive. Learn more about Touring Discoveries in Eastern P.E.I. Click the photo below to see some more beautiful imagery in our photo gallery!